"Leading Edge Landing Lights For Experimental Aircraft"
We recognize the Sonex line of Kits as one of the most cost effective Aircraft available in the market today. Straightforward and low cost aluminum construction, lower cost engine alternatives, and overall great performance. Because we had requests from Sonex builders we adapted our kits to support them. Our kits may cost a little more than a DIY effort, but they do offer a complete and ready to install alternative that will give a clean and consistent result and leave you with a very serviceable and attractive light in your wing, while saving you the time and headaches that can come with trying to design your own. Our Leading Edge landing Lights have been designed with specific things in mind. First, you need a good, clean, adjustable installation, that is cost effective and puts the light where you want it. As with many certificated aircraft, we use a wing cutout that limits the light to forward and down output, not allowing the light to shine 'up' where it can interfere with the pilot's peripheral vision in dark, hazy, or misty conditions. The larger cutout on the underside of the wing allows light to spill onto the Taxiway in front of the wings and to the sides. One of the nicest benefits to our designs is the wide range of light options that are available to the builder. You can start with the lowest cost light, or even our 'Installation Only' kits without a lamp. From there we provide several very easy options, and ALL of our lights will easily 'Upgrade' to any of our newer Lamp options. You can even use different lamps in each wing, to balance performance and cost, while keeping the 'appearance' the same (ie Round 100w in the right wing and Round HID in the left). A BIG consideration for Sonex builders is how many Amps of power their lights draw. Our 55w Rectangular light has a relatively low draw of 4 amps at 14vdc, but because of the size of the reflector, it has a light output superior to the 75w MR-16 2" round lights that are popular due to their low cost. Unfortunately, at 75w they draw 1.3 amps more, so we feel our 55w lights deserve a closer look. NEW - LED Lamp and Kit options! Now you have 2 low power draw and great light output options! Note - Philips has developed a 55w replacement bulb (CrystalVision(TM)) that has a whiter/brighter output at the same power draw. This bulb is available from Duckworks for $19. This Kit uses a low cost 4-inch "PAR 36" reflector, which is the same 'size' reflector as our HID units, and gives builders the option of a Round Duckworks light. Although it's a bit heaver and more expensive than the Original 55w Rectangular, it's the perfect solution for those interested in the PAR 36 form factor. For Sonex builders, we don't think the 100W bulb is viable due to the 20 amp alternator that is typical for the powerplants available to you. We offer it so that there is a 'round' lamp option for you. We think a better solution (if you want the round light, ie to match an HID in the other wing), is the round enclosure with the special Philips CrystalVision(TM) bulb. Duckworks now offers 1 Light Emitting Diode (LED) light Kit for the Sonex airfoil/wing. The benefits to the LED are very bright light output, amazingly low power draw, and very long life. NOTE - Because the LED lights draw less than 2 Amps when on steady, there is no reason to scrimp on lighting. Duckworks has always prided itself on providing great products at reasonable prices - the low power draw of the new LED lights now allow even an aircraft with a 20 Amp alternator to run 2 lights! Extremely bright, white light, 320,000 candlepower! Significantly less power consumption, just 9 watts (less than 1a)!! To order Kits, Lights, or Upgrades, go to the Sonex Order Forms on our Ordering Info page. 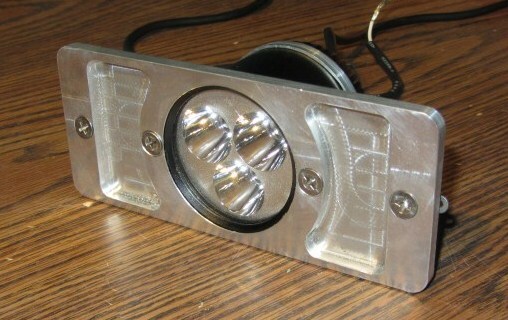 Our 2" LED Light at less than 1 Amp! (9W) is a great solution for the Sonex aircraft. The new LED lamps come with a bracket that makes them fit directly in your existing Rectangular mounting plate, for a very easy upgrade. See our FAQs for questions. Click here for the Upgrades page. Copyright © Don Wentz, Duckworks Aviation. All rights reserved.